St Mary's Chickney Church is the next parish to the east of Henham. As a number of residents were born in Chickney and resided or were employed in the parish of Henham, we are currently adding their parish records to this site. Chickney is a small parish standing high with good views. 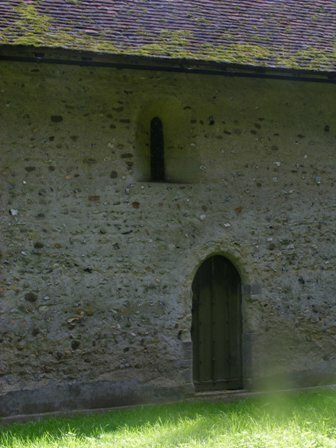 There is not much here, but what there is, is rather special – the only old house in the parish noted by Pevsner is Sibley's Farm about a mile away, 14-15th century house with fine period fireplaces, staircase, windows, doors and wall painting. The aisled barn behind Sibley's is Tudor and close by is a medieval dovecote, said to be one of the oldest in Essex. The fantastic little thousand-year-old church, which became part of Broxted parish in 1972, and is no longer used regularly, but looked after by the Churches Conservation Trust. Inside St Mary's Church it still has a Saxon nave and, as Pevsner puts it, 'hardly a right angle to be found'. The pre-Reformation altar slab with five consecration crosses was restored in Victorian times from its hiding place buried in the churchyard – a wonderful find. There are original splayed windows and some 14th century features too - the tower and carved font. Look out for some interesting graffiti carved in the soft stone centuries ago, and scratch dials on two of the south windows. The plan is erratic, the axes of the chancel are Pre-Conquest. 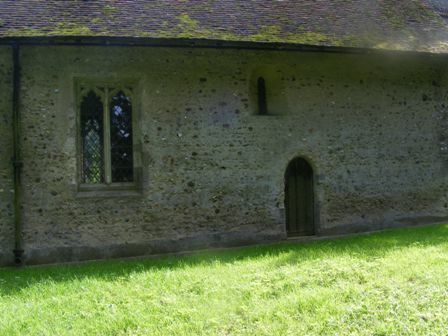 The chancel was lengthened in the 13th century and the tower in the 14th century. The timber framed porch is probably 15th century. One original window remains on the south side of the nave and a blocked in one on the north. The fittings include a 13th century alter slab, two 15th century bells by John Kebyll of London and an interesting early 15th century font with demi-angels and heraldic shields on the bowl. Arthur Mee's classic book on Essex calls it 'one of the oldest and most remarkable churches' in the county, and you can feel the age of the place, set in an oval churchyard – itself a sign of Saxon beginnings. So although Chickney is tiny, it is really rather special. Perhaps the best expression of this is in Simon Jenkins' sumptuous book, England's Thousand Best Churches (1999), among which he numbers Chickney: 'This must be Essex's most improbable church. It lies detached from any village beyond an asparagus farm. 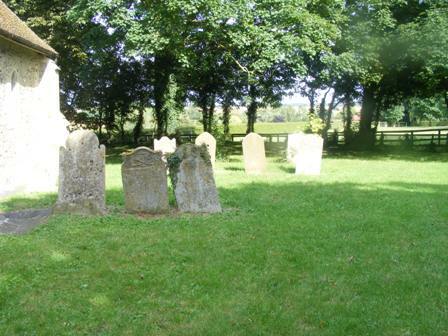 Pheasants rise shrieking from an overgrown churchyard, which is sheltered by chestnuts and sycamores. Nothing else moves or breathes. The church has a dunce's cap for a spire. The interior is small and atmospheric, with a chancel askew and a nave that is not quite a rectangle… The chancel is filled with furniture, like an old attic… Though redundant, the church is still supplied with candles and fresh flowers. Chickney is not unloved.' (p182). Any visitor would see the truth of this – Chickney Church is a wonderful survivor of Saxon England, unspoilt by the Norman invasion or the thousand years of history that have passed since it was built.